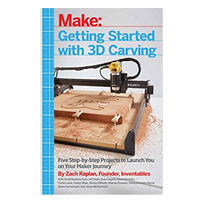 This book was written for people who have never used a 3D carving machine. It teaches the basics of designing and making things with Inventables' software (Easel) and 3D carving machines (X-Carve and Carvey). We'll take you step-by-step through five projects you can build yourself as a beginner: an inspiration tile, kitchen cutting board, custom block stamp, fidget spinner, and balsa wood glider. The book also features aspirational projects from makers in the community, like an electric guitar, to show what is possible through 3D carving. The design files and instructions for projects - ranging from beginner to expert - can be found on the Inventables website.